Today I thought we would take a trip to Greece. Last week I found Alanna Kellogg's great website Kitchen Parade and this great recipe for Greek Feta Chicken. I wrote to her and told her it sounded great and promised to try it out and let her know what the verdict was. 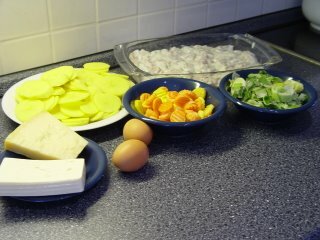 I liked the idea of preparing something light and easy for lunch, especially on a hectic Saturday! Whisk the first four ingredients ( yoghurt, garlic, herbs, salt & pepper) together. Place the chicken in the marination and marinate for at least 30 minutes. Place chicken on oven rack and bake for 6 to 8 minutes, then turn over. Sprinkle with feta and bake for another 5 to 8 minutes. Tom found it a tad too dry. I served this with a Potato/Vegetable Gratin which had a bit of liquid to it so it was not all that bad. 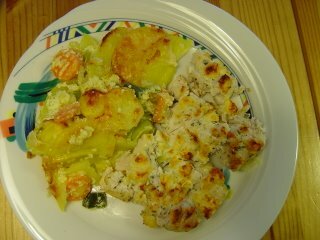 Soeri, picked off the feta and ate the chicken mixed with the gratin. The next time I will maybe take the chicken out of the oven in between and coat with the marination, or maybe put the chicken with a bit of the marination into the oven to keep it moist. Hi Meeta - Thanks for trying the chicken! I'm wondering about the dryness -- did you put the chicken straight onto the oven rack vs on a pan on an oven rack? That would make a difference because there'd be direct heat from all directions. But the in-between marinating is a good idea so long as it's done very quickly -- you don't want to risk cross-contamination from the uncooked chicken. You mentioned broiler in your recipe I used the oven. Maybe that's where the trouble was. I put in directly on the oven rack covered with aluminium foil. But you know what? I ate the leftovers for lunch today and added a tiny bit of milk while heating it in the microwave ... and it tasted great! 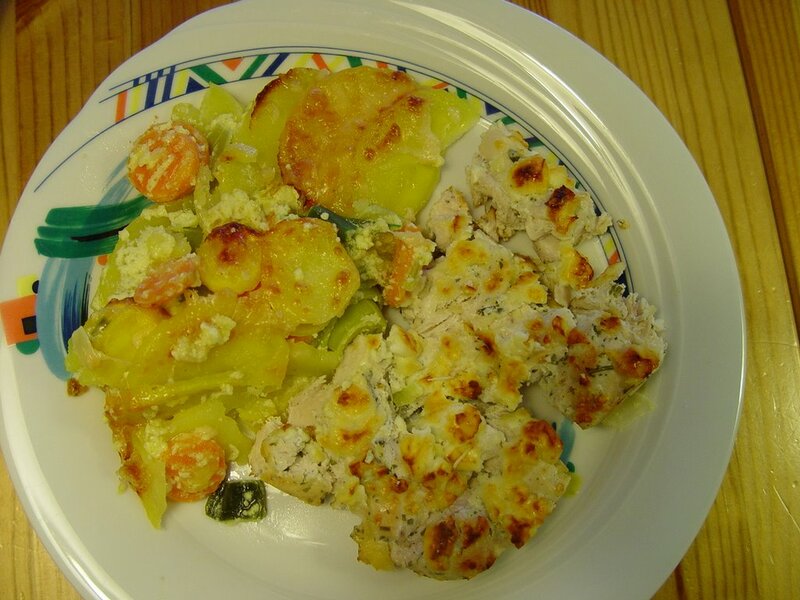 I liked the recipe and chicken and feta is a real winner on the taste buds.